I used to believe that magic was some outside wonder. An attainable feeling that we can pull into and around us, as if there was a Magic Championship we would climb the ladder for, then achieve and harness, if we just believed hard enough. As the turn of the Sugar Creature evolved, tagging with you Travis, I realize it’s so much more than that. You made me see the whole scope. Magic can neither be created nor destroyed, it is nurtured from within. It is brought out by those that want us to reach the ultimate version of ourselves. Your journey from the crowd, to being a referee, to being by my side is nothing to overlook and you’re more than “just” Travis Huckabee. 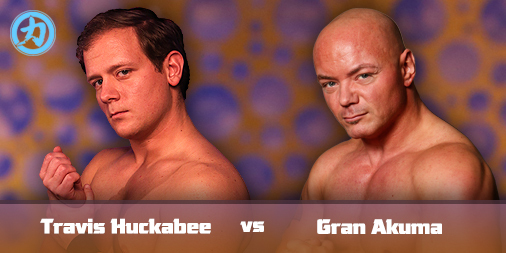 You’re my teammate, the "Golden Grappler," Travis Huckabee, a Rumblebee. No matter what side of the guardrail you’re on, we’re all connected, even when you were watching Gran Akuma from the other side. I know you studied guys like Akuma and Icarus, admired them from afar. Akuma is grand, but he, like you and I, is human. Don’t let the admiration of man, become greater than respect. Beware of the folly of hero worship. He's a wrestler. Now, you are too, Travis. From when we started to now, we have grown so much together. Just look at our pictures from when we started versus how we are now! I believe in us, T-Rav, so much so that I will be spreading the buzz about the Rumblebees in MA this Sunday. I won't be there to cheer you on to victory, but the CHIKARMY won't let you down at "Beware the Snowman." I have a 10-year history with CHIKARA, but most of those years were spent as a fan, then as a trainee and referee, and only just recently, as a professional wrestler. During our holiday break, I fired up CHIKARAtopia and revisited some of the older events that made me a fan, way back when. If I wasn't feeling nostalgic already, it was during one of these viewings when I first heard news about my opponent for the Season 19 Premiere; the upcoming "Beware the Snowman" card. I'm scheduled to face Gran Akuma. I still remember the stories that I had heard about Gran Akuma. There were two that I always remember for whatever reason. The first was that Akuma was forced to wear two pairs of kickpads, because his kicks delivered so much force. When he didn't double up, the other trainees in class would drop like flies. I'm not sure if that story is true or not, but I wouldn't be surprised if it was. The second is that it took him less than a year, from the day he began training to make his in-ring debut. He's a natural. That story I KNOW to be true. To hear a story is one thing, but to SEE something is very different. When I first became of F.I.S.T., they were already los Campeones de Parejas. Having fought for the Campeonatos before, I can speak to what that means. I know how hard the journey can be, and how seemingly impossible it can feel to stay atop the mountain once you conquer it. If this wasn't enough, I was there in March of 2009 as Akuma, Icarus, and Chuck Taylor defeated none other than Claudio Castagnoli, Dave Taylor, and Bryan Danielson to win King of Trios. I am no Akuma. I'm just Travis Huckabee. I am the Golden Grappler and I am the one who chased his dream for a decade to get the chance to step into the ring with some of those greats that came before me. Akuma hits hard, but so did Silver Ant, and so did Rory Gulak, and I took what they had and came back for more. Akuma is a natural in the ring and he's always training, always making himself better, but no one logs more hours at the Wrestle Factory than I do. It took me less than a year to earn a spot aside Zack Sabre, Jr., Hallowicked and Mike Quackenbush in the Johnny Kidd Invitational. The fan in me couldn't be more excited for January 28th and the wrestler I've become will give 110% between the bells. My opponent hasn't had much of a challenge since returning to CHIKARA. I'm going to change that, at #BewareTheSnowman. As N_R_G, Race & I fought uphill against all kinds of challenges. We went through every tag team on the roster. We were always the underdogs, and we faced adversity at every turn. Our opponents underestimated us, and the fans were cold toward us. But we persevered, and in time, we flourished. We went from not deserving to be in the ring with the top-tier tag teams in CHIKARA, to realizing we could be their equals. We met our goals and we succeeded. We traveled the world and challenged one of the most intimidating teams in The Devastation Corporation and eventually dethroned them...right in our own backyards. Some nights it felt like Race & I were not on the same page, but on September 27th, 2015, everything clicked. We walked into the Norfolk Temple with something to prove. We walked out as Campeones de Parejas. You don't have to fast-forward all that much to find out that maybe Race & I weren't on the same page for very long. In Season 17, it wasn't our in-ring chemistry that defined us, it was one man's selfishness and narcissism. After our championship heights, we suddenly found rock bottom. Race showed me he could be the lowest of the low. After "Left Behind" there was a new goal in front of me. I had to recover from Race's betrayal. I had to recover from having my orbital bone fractured. I had to find a way to show Race the error in his ways. The road back wasn't an easy one, and it wasn't quick either. I spent a lot of time on the sidelines, just watching. My injuries needed time. I needed time to watch. If you fast-forward to "Closing Time," you know I did my homework. I studied Race while I recuperated, and eventually, I made good on a promise I had made to myself during those long months of recovery. I'll never have to see the face of the man who turned his back on me, ever again. And in CHIKARA, neither will anyone else. It was a challenge to become Campeones de Parejas. It was a challenge to defeat the partner and friend who betrayed me by dropping a stage on my face. Now, on January 28th, I face a new challenge, and I am ready. At "Beware The Snowman" I will challenge the Grand Champion of CHIKARA. I will stand across from Juan Francisco de Coronado and I will not be content to just prove I am his equal. I must be just a little bit better. If I want my name to be counted among the most celebrated in CHIKARA's 16 year history, alongside Hallowicked or Princess KimberLee or Icarus, I must be better than Juan Francisco on January 28th. His technical skill is impressive, don't get me wrong. But the Grand Champion has never faced someone as powerful as me before. Wrestlers big and small, experienced or inexperienced know this to be true: you're only one ride on the Hyperwheel away from counting the lights.